Unordinary Style: Not Toe Shoes! I have a variety of paid positions that I perform. One of the side jobs I do is being contracted as a coach to mentor about 6 adults doing a job I have been deemed to be pretty good at. It is kind of weird as we are all on the same level as each other, I just happen to specialize in something they are trying to learn. So.... I am at this event where they are there trying to learn something and I am sitting at their table trying to help clarify everything for them and provide them with one on one assistance. It has been quite enjoyable and one of the aspects of the position has been to develop good relationships with these people. Which I have been working hard to do and I think it has been going quite nicely. This other guy sitting over at another table kept fidgeting with his shoes. And do you know what those shoes were? 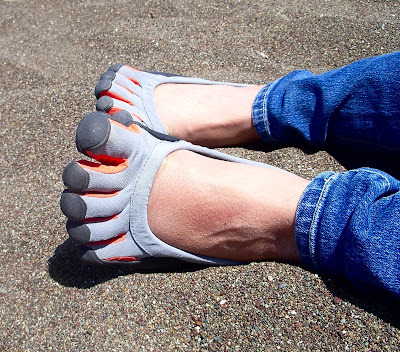 Yup, toe shoes. Sorry if you are a toe shoe wearer, maybe they are the absolute best things on the planet, but I really think they are ridiculous! Is that weird coming from a guy who wears women's clothes? Okay, maybe more than bit, but come on really, toe shoes?! Okay, so this guy is fidgeting with his toe shoes, and one of the ladies I coach is staring at them, and so I am. I quietly whisper to her "Oh no, not toe shoes!" and she just busts up laughing! Immediately so do I. Her laughing infected me and mine reinfected her. But it was the kind of laughing that you did when you were in school where you and your best friend were busting up laughing but trying desperately to keep it inside. So she and I sat laughing, trying to choke it back, while all the other's at our table looked at us and wondered what was going on. It felt like forever until the giggles subsided, I grabbed some tissues to wipe the tears from my eyes, and I regained some composure. I couldn't tell anyone else though, because I was going to loose it. So.... hmmm....... is it hypocritical of someone born a male who dresses as a woman, who some may think is kind of ridiculous, to be laughing at someone who wears toe shoes? Well, it wasn't really the guy though, it was actually just the toe shoes. Okay, I still just can't get over it! Toe shoes at a semi-professional work related event? Nope, sorry, can't love em! Love the wearer, not the shoes, I just can't do it! Really, I was laughing at the shoes, not the person!